In 2015, Super7 brought back official MUSCLE mini figures, only with Masters of the Universe characters instead of Kinnikuman. Since then, the company has been steadily giving other franchises the MUSCLE treatment, including the one you see here -- Alien! Being such a beloved franchise for over 35 years, it's safe to say several people were waiting a long time for proper Alien mini figures and must wait no more. Super7 debuted Alien MUSCLEs in late 2016, in the classic MUSCLE "flesh" color, which you can see (and purchase) here. Since I'm not as big of an Alien fan as some, I decided to wait until the figures were released in a color I found more interesting. That brings us to the figures you see here, in a translucent "blood red" color, released earlier this summer at San Diego Comic Con. 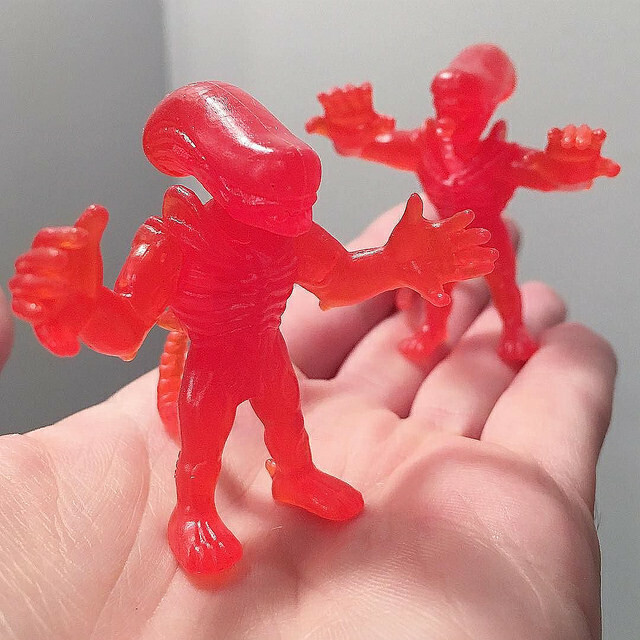 While they may not show detail as well as plain ol' flesh, clear red Alien minis were just too magnificent of a thing to pass up. 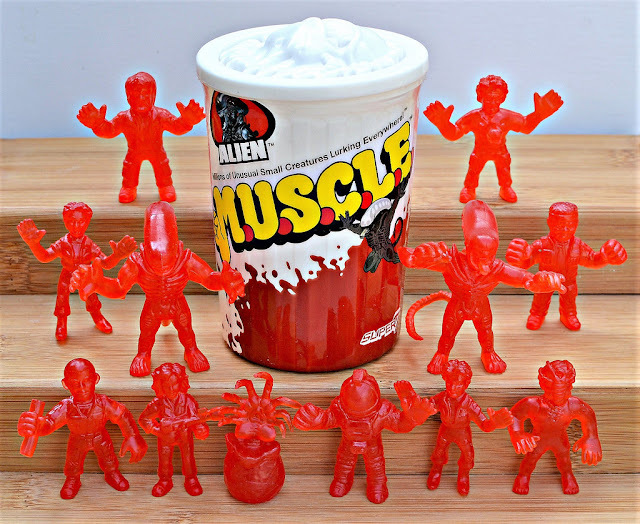 To add to the appeal, the set of 12 SDCC figures comes in a classic MUSCLE trash can, in white plastic with an awesome embossed lid featuring an Alien Chestburster. I believe the blood red set is the only variety to have been released so far in this way instead of in standard blister packaging. The 12 characters in the Series 1 set include: Alien, Attack Alien, Ripley, Ash, Alien Egg, Parker, Kane in Spacesuit, Kane with Facehugger, Kane with Chestburster, Brett, Lambert and Dallas. Of course, the coolest figures are the Aliens themselves. All of the figures are very well done, but human minis are just never gonna be as cool as monster minis. 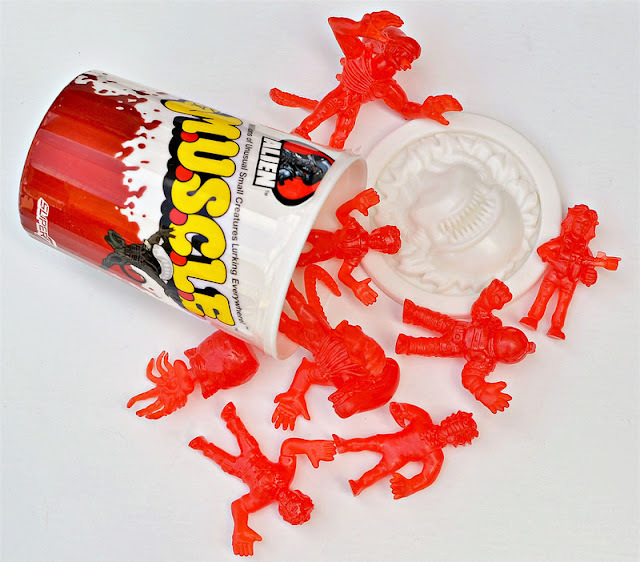 At the time of writing this, the Super7 store still has some Blood Red sets available, in addition to other Alien MUSCLE goodies including Series 2 figures featuring characters from the second film. Being only a casual Alien fan, I'm not sure how far I'm going to dive into this line. That said, I certainly wouldn't mind having an army of mini Aliens in various colors! What about you? Have you picked up any Alien MUSCLE? Not to knock this line but I feel there needs to be a much higher ratio of aliens. It would be nicer still if there were more alien types than humans. The humans of this line are 'little' but not very weird are they? The mega man muscle line I saw on the super7 site looks 'weird-o-ier' ( weird-o-ier copyright anonymous poster), as well as little. Though perhaps Mega Man isn't one of your interests? Well, one of the humans has an alien bursting out of its chest and another has an alien on its face, so those are pretty weird! As for the Mega Man MUSCLE, I haven't been compelled to get those yet and I heard there were some quality issues with that set. Touche! Aliens latching onto and bursting out of humans are indeed weird. I still argue for more aliens though. :) And shame that the mega man muscles had quality issues. Were they too brittle/breakable? I do agree--the more aliens the better!